New book, 80 pages, SS10229. 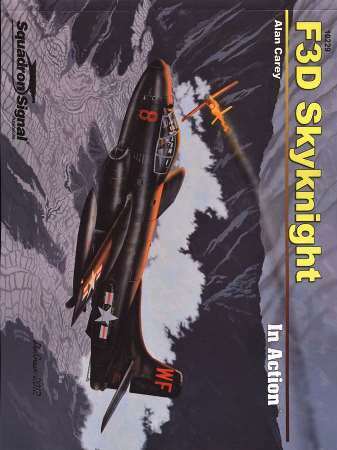 The US Navy's first all-weather jet fighter, the Douglas F3D Skyknight, traces its origins to 1945, when the Navy began studies for a jet-powered, carrier-based night fighter. Ready for service when war broke out in Korea in 1950, the Skyknight, also known as 'Willy the Whale', proved its worth in the capable hands of pilots and radar operators with Marine Night Fighter Squadron VMF(N)-513. The F3D scored the highest number of aerial victories for an all-weather jet fighter in that conflict. Later, in the late 1950s and 1960s, Douglas Aircraft, in conjunction with the Navy and Marine Corps, modified a number of the Skyknights to perform a variety of tasks. This book chronicles the development and operational history of the Navy fighter from conception to duty in the Korean War, to service as a night interceptor in Vietnam, where it was an ECM/ELINT platform, jamming North Vietnamese missile and anti-aircraft sites. Packed with never before published color and b/w photographs covering the entire operational life of the F3D-1/2, F3D-2B, F3D-1/2M, F3D-2T2, and the EF-10B variants. Illustrated with more than 196 photos and 10 line drawings.